300-thread count cotton sateen sham. Oakmoss & Amber Candle, 8 oz. 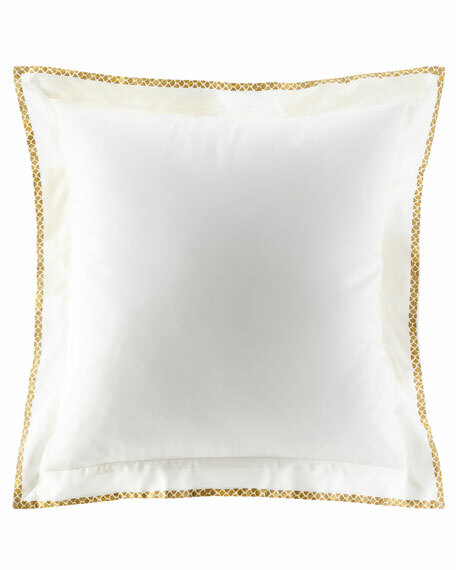 EXCLUSIVELY AT NEIMAN MARCUS Medallion sham with tassel trim finish. Front, polyester/polyester chenille. Back, cotton/polyester. Hidden zip closure. 25"Sq. Dry clean. Made in the USA of imported materials. Sham reverses from sand to paprika. Linen. Mini welt trim. Zipper closure. 26"Sq. Dry clean. Made in the USA of imported materials. Floral cotton sham has mini welt trim and 2" paprika flange. Sand linen back. Zipper closure. 26"Sq. Dry clean. Made in the USA. Set includes 90" x 95" floral comforter and two matching shams. Comforter is hand-quilted polyester with 3" flange and cotton back. Shams have a 2" flange, polyester front, and cotton envelope back. Dry clean. Made in the USA of imported materials.